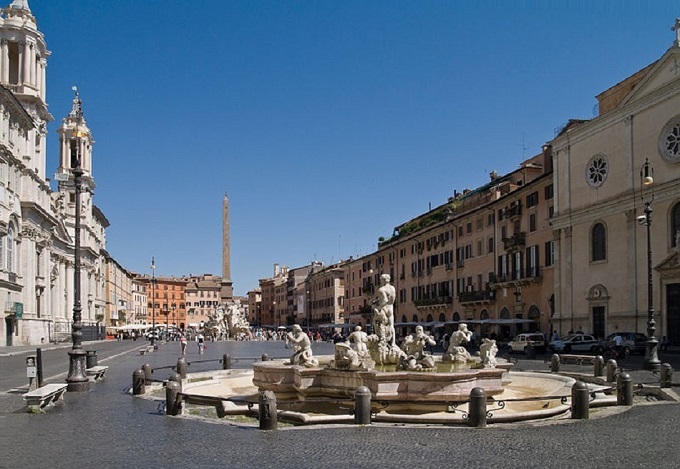 Navona Square is one of the largest and most beautiful squares of Rome. 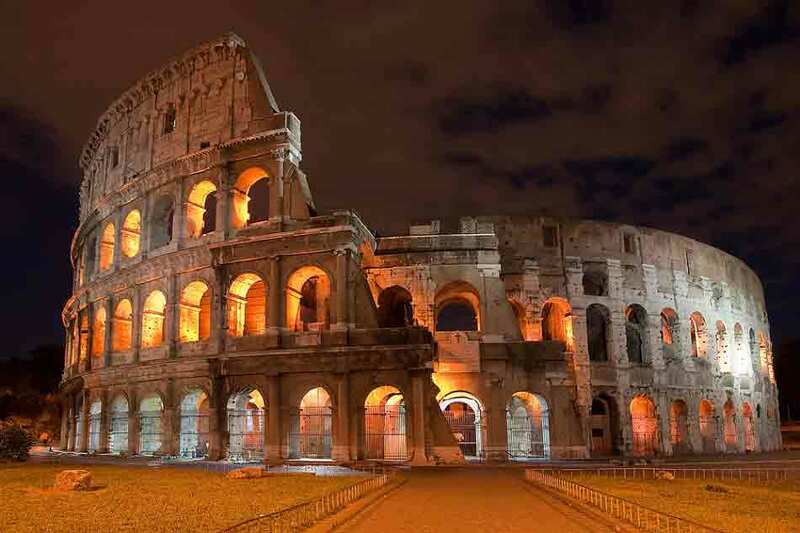 The shape follows closely the area of ​​the Stadium of Domitian which in some places it is still possible to see the remains. 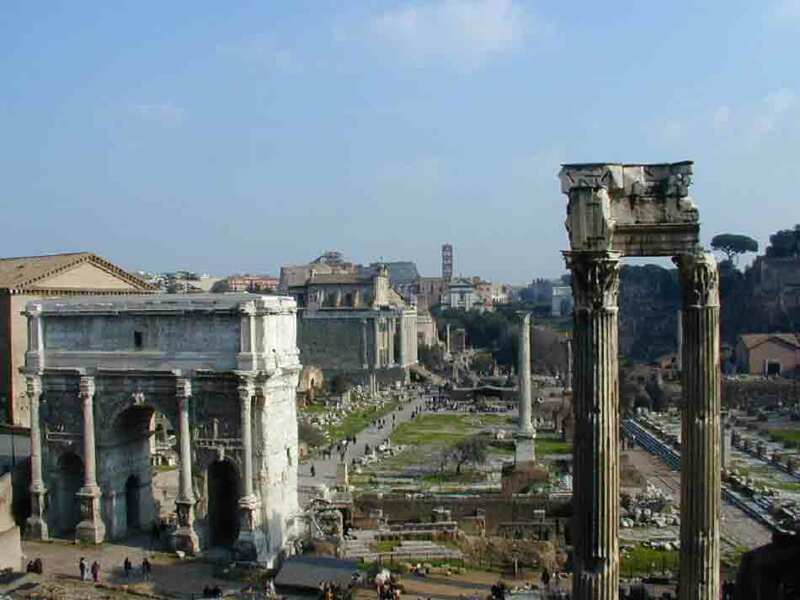 Navona Square, in ancient Rome, it was the Stadium of Domitian, which was built by the emperor Domitian in 85 in the third century and was restored by Alexander Severus. It was 276 meters long, 106 wide and could accommodate 30,000 spectators. The stadium was decorated with statues, one of which is that of Pasquino (perhaps a copy of a Hellenistic Pergamon presumed representative Menelaus supporting the body of Patroclus), now in the square next to Piazza Navona. 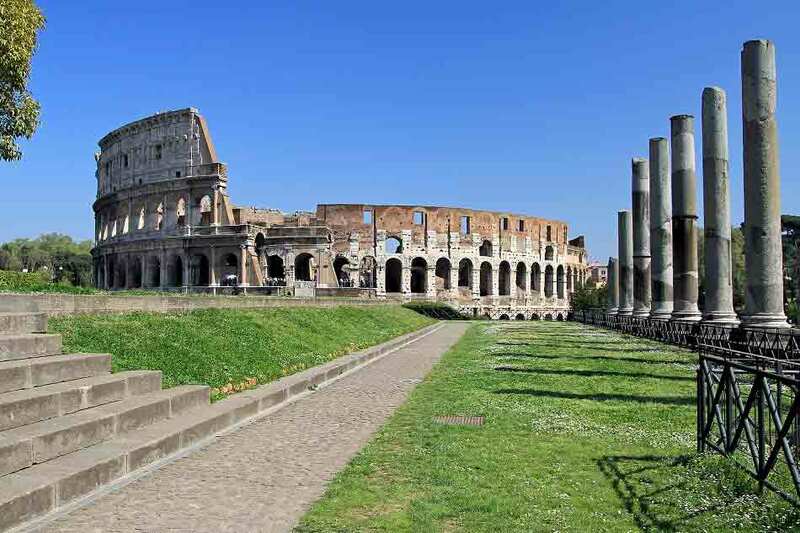 Since it was a stage and not a circus, there were no carceres (gates from which protruded race horses) or the plug (the dividing wall around which the horses ran) such as the Circus Maximus, but it was all free and used for competitions of athletes. The obelisk which is now at the center of the square was not there, but it comes from the circus Maxentius, who was on the Via Appia. The square's name was originally "in Agony" (from the greek agones, "games ") because the stadium was used exclusively for athletics. It is not true that Piazza Navona was used for naval battles: it is a myth created by the fact that the square was flooded usually in August to soothe hot, once the square was concave, freezing the closures of the three fountains and water came out to flood the square. Between 1810 and 1839 races were held in the square to the jockey, horse racing that is fitted (but does not have relationship with the most famous races of the barb of Via del Corso). The renovation of the square is due to Pope Innocent X Pamphili who commissioned the architects Carlo and Girolamo Rainaldi the construction of a palace, which had a large square courtyard as a bit ' as they did before him Farnese and Barberini, and the church of S. Agnes in Agony, architects demolished many hovels, merged other and built from scratch the Pamphili palace. Navona Square is in a sense the pride of Baroque Rome, with architectural and sculptural elements such masters as Gian Lorenzo Bernini (Fountain of the Four Rivers in the center of the square, which is the Danube, the Ganges, the Nile and the Rio Plata, the four corners of the Earth), Francesco Borromini and Girolamo Rainaldi (the Church of St. Agnes in Agony, in front of the fountain by Bernini), and Pietro da Cortona (author of the frescoes of the gallery of the Palazzo Pamphili). 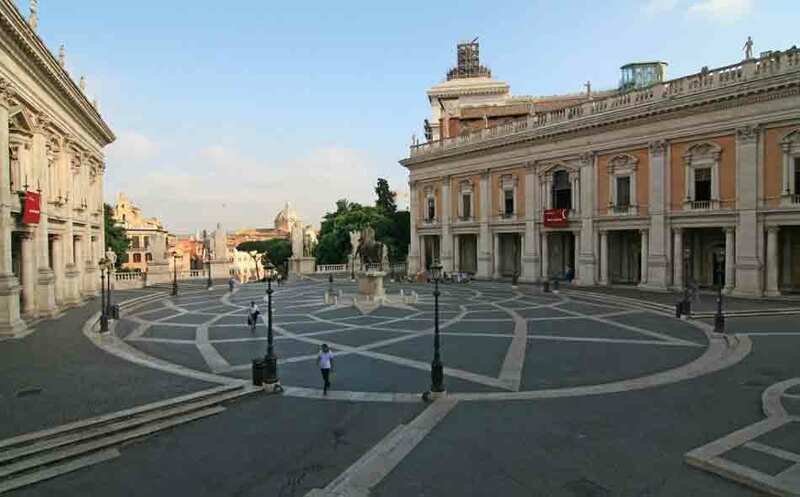 The square was to celebrate the greatness of the House of Pamphili (in a sort of competition with the Barberini and the Farnese) and Innocent X (born Giovanni Battista Pamphili) wanted the building of the palace of the same name and that the square was decorated with works of significant value. For the reorganization of the area is therefore resorted to the demolition of several blocks, while the tender for the award of contracts was fought without exclusion of wits between the main architects of the time, a major role in the choice of artists was also played by the powerful Donna Olimpia Maidalchini (influential and relaxed sister of Pope Innocent X), which can be said for example that Bernini had donated a silver model of the design of the fountain, but according to others it was always her choice to replace Rainaldi, Borromini in the completion of church. Dominates in the center of the spectacular Fountain of the Rivers by Bernini depicting four major rivers: the Ganges, the Nile (with the head veiled because its sources were unknown), the Danube and the Rio de la Plata, the 4 figures surround a large obelisk granite height of 16.5 meters found in the Circus of Maxentius but most likely from the Temple of Isis. Other figures in the fountain are the lion, the horse, the snake of land and the marine environment, all huddled figures or protruding from the precious carved cliff directly from G. L. Bernini. The well-known legend about the supposed rivalry between Bernini and Borromini suggests that two of the four statues of the rivers malignant Bernini wanted to grant special protections against the work of the adversary: the Nile a bandage on his head to escape the unhappy vision and the Rio de la Plata, an outstretched hand to ward off the impending collapse of the church perhaps, but the belief is unfounded because the fountain was built before the church (as is known, then, the Nile has his head bandaged because at the time were not yet been discovered its sources). What is true is that on the facade of the church, the statue of St. Agnes has a posture that opens up many possible interpretations, including the one that the famous hand on his chest, along with the expression of the face is a sign of bewilderment. The "competition" between the two authors, at least in this square, was resolved in playful tones: the criticism of the staff Borromini on the possible static sealing of a hollow structure, the staff competitor said dryly, staring at the group with "reassuring" rods simple string. Navona Square has two additional fountains: the Fountain of the Moor, sculpted by Giacomo della Porta and retouched by Bernini, located in the south of the square, and the Fontana del Nettuno (Fountain of the originally Calderari), located in the north, the work Gregory Zappala and Antonio Della Bitta. The church commemorates the martyrdom that Santa would have suffered precisely in that part of the square and, according to legend, was built exactly on top of the brothel where the crimes occurred and that it would be perpetuated in that capacity until precisely at the time of construction, in the current building's basement. Indeed, it is precisely the arches of these underground to the Latin word fornices also assumed the meaning of brothel (also determining the derivation of the root of the verb fornicate). The present church stands where since the Middle Ages had already been erected a small church parish. To bring out more the dome Borromini concocted a concave facade and put two slender towers on the sides. Inside the church are exhibited many works, stand the altarpieces and the decorations of the dome, also to secure relief is the so-called Summer Sacristy. 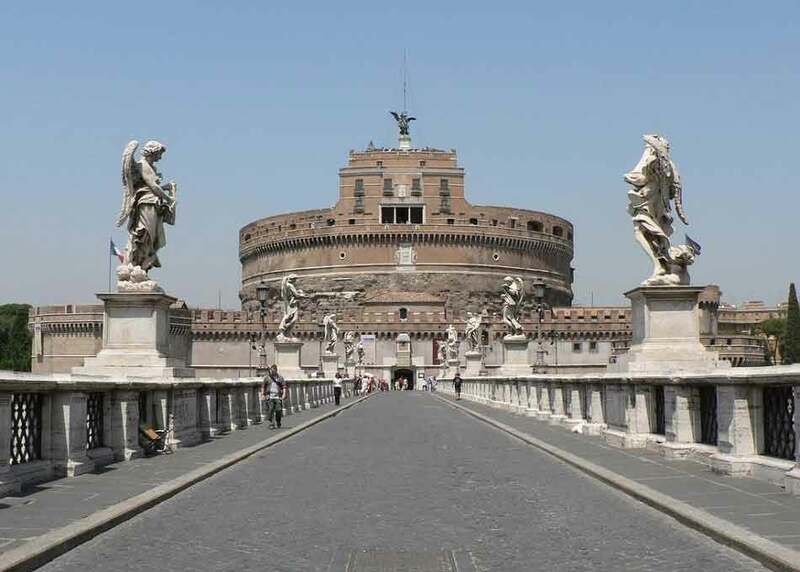 Pope Innocent X Pamphilji, he also built the beautiful palace to the left of the church of S. Agnes in Agony, is currently the Brazilian Embassy, the project was entrusted to G. Rainaldi who completed the work in 1650. Another church faces in Navona Square, this is the fifteenth-century Our Lady of the Sacred Heart (formerly s. Giacomo degli Spanish) works within this Renaissance church ended up in large part to the Prado museum, the church with the advent of the French missionaries of the Holy Heart had as its main entrance to the Navona Square, then in 1936 the main entrance was moved during the Renaissance. Inside a beautiful chapel designed by Antonio da Sangallo the Younger. • Braschi Palace - the end of the eighteenth century, that stands on the site of the palace built by Francesco Orsini prefect of Rome in 400. • Lancellotti Palace (already de Torres) - built around 1552 by Pirro Ligorio. • Pamphili Palace - built between 1644 and 1650 by Girolamo Rainaldi. • Tuccimei Palace (formerly de Cupis Ornani) - built in the second half of the sixteenth century, of a building and the neighboring houses of the previous century. The square hosts a market that over time it has become traditional for the town. 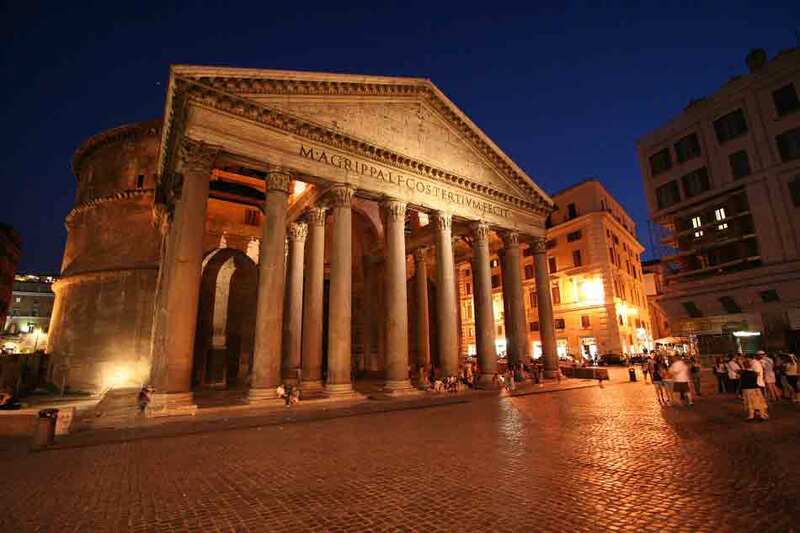 Born as a local market (in fact it was the transfer of the Campidoglio Market), similar to the one still active in Campo de ' Fiori, appeared characteristic for the location of the counters that more or less as at present, followed the oval. During the warmer months, the market was suspended for the use of flooding the square for the purpose of refreshing citizenship, custom still in use (as well as witness one of the sonnets below) until the nineteenth century. Over time, due to the ever increasing tourist destination places, the market was slowly poured on existing nearby market of Campo de 'Fiori square and limited to only this Christmas season, and perhaps also the time limit, the value this traditional market has become more dense thickness, reaching its peak with the feast of the Epiphany and making the "Befana in Piazza Navona" one of the most widely felt of citizenship. After the war, as well as the steps of Trinita dei Monti and Galleria Alberto Sordi already Galleria Colonna, many painters and designers have begun to frequent the square putting easels to paint and to expose (including for sale) their creations and, in parallel, was born also the well-known use of taking portraits (even caricatures) for passers-by, and in recent times the square has become a meeting place and performance of "road artists" that make it, especially in the evening, one of the the most vital and interesting city.